Click here to download aCurrency. 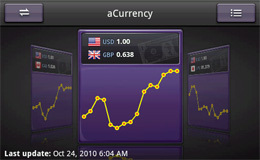 aCurrency is a currency converter for 160+ currencies with daily exchange rates updates. Track multiple currencies at the same time. Add currency widgets on home screen. Show currencies in either card-flow view or list view. 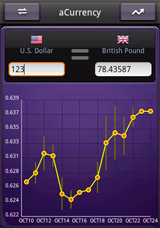 Support one-to-one exchange rate calculator. Automatically download the newest exchange rates on startup. Enter an amount with we provided virtual digital keypad without opening the keyboard. Change a currency selection by typing its code or the country name. 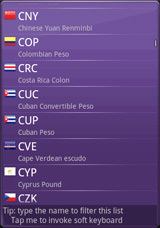 All currencies are provided with their currency code, country, and flag for major currencies. Tap the currency card will invoke the 1-1 exchange rate calculator. Press and hold the currency card will bring up a menu. To enter an amount to convert, please tap either the "Enter an amount for top currency" or "Enter an amount for bottom currency"menu item. Select the "Charts" menu item will invoke the history charts window. 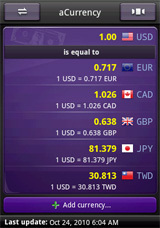 Tap the "Swap with base currency" menu item to exchange the selected "Target currency" with "Base currency". To edit the currencies, please tap the top-right currency list button. It will show the currencies in list view for you to add/delete/edit the currencies. Tap the "Base currency" (top selection) item will bring up a menu. To enter an amount to convert, please tap the "Enter an amount" menu item. 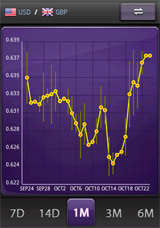 Tap the "Toggle Inverse Conversion" menu item to see the values with inverse exchange rate. You can enter an amount through aCurrency provided virtual digital keypad without opening the keyboard. Tap any of the currencies listed below "Base currency" will invoke the 1-1 exchange rate calculator. Press and hold any of the currencies listed below "Base currency" will bring up a menu. Select the "Charts" menu item will invoke the history charts window. Tap the "Swap with base currency" menu item to exchange the selected "Target currency" with "Base currency". To remove a currency from view, please select the "Remove this currency" menu item. To change the order, you can tap either "Move up" or "Move down" menu command. Move your finger over the curve will show you the rate in bigger font. Move two fingers over the curve if multi-touch is supported on your device. First tap the curve to set the base date and then move a finger over the curve to show the percentage change from the base date. To unset the base date, please double-tap the curve or tap the base date. You can create aCurrency widgets on the home screen by touching & holding an empty area of the Home screen, selecting Widgets from the menu, and then selecting aCurrency widget. The widget enables you to customize the base currency, target currency, and theme. More menu commands will be explained below. 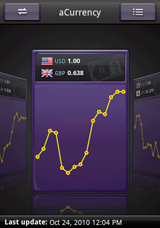 Download daily updated foreign exchange rates from aCurrency server. This command needs Internet access capabilities. Please make sure that your Internet connection is enabled before you execute this command. To get the latest version, please visit http://android.a0soft.com. If you find any incorrect information, please also e-mail your problems to support@a0soft.com.